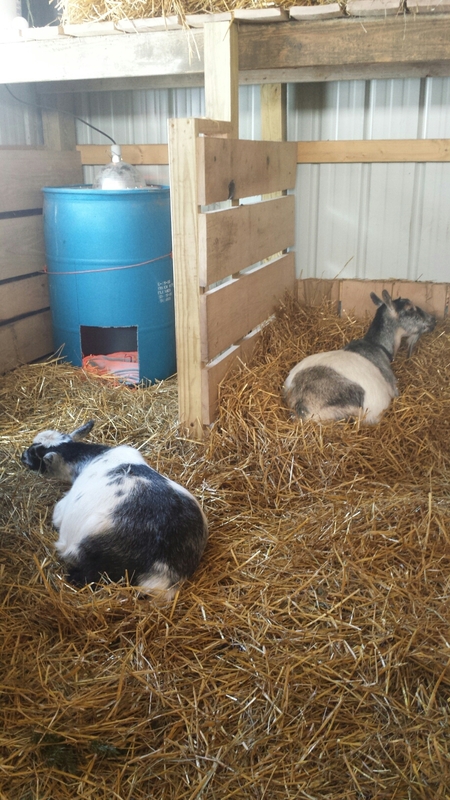 We have had several births this year, our first full year of raising goats. We have a post about preparing for kidding, but we were hoping we were truly prepared. While our first two mommas gave birth during the night, the last one was a mid day affair, and it turned out to be a very good thing! Sashimi, on the left in labor, is being attended to by her mom and her sister. It was very cool to see how they wanted to keep an eye on her and seemed to be encouraging her in the process. At this point in the deliver, I was not too worried, and feeling pretty relaxed about being a labor and delivery nurse for a goat. When the baby started to come out, we (my bride – Mrs. Blue Barnyard) realized there was a problem. She said the head and hoof were not lined up correctly and she needed to “go in” and fix things. Ok – so now I am not feeling so good about the whole goat nurse thing. I was convinced that nature was cool and would handle it, but she said it was time to glove up and help her out! I held the goat and kept saying nice soothing things to her to calm her down, at least that was my intent. After the intervention, things went smoothly and a little beauty was born. Momma took care of her and it was pretty amazing to witness. Later, after speaking with our vet and describing the process, he confirmed that if Jess had not intervened, we would have likely lost the mom and both of her twin babies. I was quite proud of all the research and the cool calm and collected way she handled this. This photo shows our youngest girl, her new momma and her grandma, all in one picture. It is so neat to see them all care for each other! Adrienne was the assistant nurse with me, and was helping care for the babies through the process.